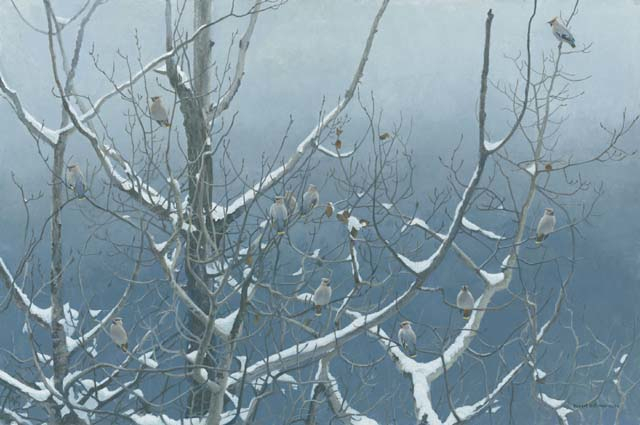 When I saw this aspen tree top from a mountain road, I immediately thought of it as a setting for a flock of Bohemian waxwings. For some reason the aspen is one of my favourite trees to paint. I usually feature the velvety gray green and scarred trunk. However, I find the architecture of the branches equally interesting. I have seen large flocks of Bohemians in aspens in the autumn. Although these flocks are usually 50 to 300, they have been seen in numbers as high as 3,000. Both Bohemian and cedar waxwings have smooth elegant gray brown plumage. I have never seen a ruffled feather. The Bohemians have rich rust undertail coverts in contrast with the cedar waxwings white plumage in that area.